The most popular beverage flavor in the United States is orange. Although consumption of orange juice has declined in recent years, it was reported Americans consumed 715,775 metric tons of orange juice in 2011. (http://www.indexmundi.com/agriculture/?country=us&commodity=orange-juice&graph=domestic-consumption) That’s a lot of juice! 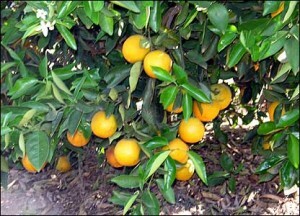 Oranges are primarily grown in Florida, California and Brazil and processed for their juice. So what happens to the peels? Peels are further processed to isolate orange essential oil. Basically, the oil is squeezed out of the peel. Orange oil consists of limonene (~90%), geraniol (~5%), decanal (~3%), octanal (~3%) and myrcene (~2%). Other components included alpha and beta pinene, citral, nerol, nonanal, undecanal, octanol and decanol. Orange oil contains hundreds of components at very small amounts. Mother Nature compounds this essential oil and sometimes flavor chemists try to copy her. Flavor chemists can make artificial orange flavor with aroma chemicals, but typically the price of orange essential oil is lower($1-$3 per pound) than artificial flavors. Also, Mother nature produces better quality than artificial. Orange oil price can escalate; due to weather and crop diseases. Also,orange oil can get diverted to other industries; limiting the supply of orange oil for flavors. In 2010, limonene from orange oil was used to clean up the oil spill off the Gulf of Mexico. When supplies of orange oil are sparse, flavor chemists can create artificial flavors to stabilize food prices. Orange oil is typically the most useful ingredient on a flavor chemists shelf. Primarily, flavor chemists are compounding orange flavors with it. Flavor chemists modify orange oil to make it water dispersible for beverages, more stable for processed foods and stronger for confection applications. We often use orange oil as the base for many popular flavors: fruit punch, bubblegum and pineapple. Next time you chew bubblegum or drink fruit punch, see if you taste the orange. Orange oil is not very stable and can oxidize quickly. If orange oil is “going off” it can smell like mango and taste bitter. Orange oil is best stored in tightly sealed dark containers with little head space. There are many different qualities of orange oil. Quality depends on how it is “squeezed” from the peel, from the region in which it is grown and from the variety of orange in which it was obtained. Flavor chemists will choose the orange oil that they feel best suits their flavor needs.